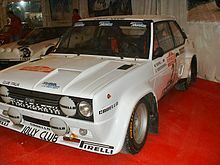 Jolly Club was an Italian racing team, which competed in the World Rally Championship and Formula One, it was mainly connected to brands like Lancia and Alfa Romeo. It was created in 1957 in Milan by idea of Mario Angiolini, the team won several championships. The team's main sponsor was Totip so the cars used orange and green colors on their livery until the World Rally Championship 1996. Carlos Sainz's and the Jolly Club team's 1993 Lancia Delta HF Integrale at the Lancia centenary celebrations in Turin in 2006. Alessandro Fiorio, 8 races and World Champion 4WD Group N with a Lancia Delta in 1987. Dario Cerrato, 41 runs between the European Championships and Italian and European Champion in 1985 with a Lancia 037. Miki Biasion, 32 races in World Championships and European Jolly Club and twice world rally champion with Martini Racing, also won the 1983 European Championship and the Italian Championship. The team also competed in other drivers like: Roberto Businello, Arnaldo Cavallari, Sandro Munari, Lele Pinto, Amilcare Balestrieri, Tony Carello, Andrea Zanussi, Gianfranco Cunico,Tonino Tognana Italian Rally Champion 1982 with a Ferrari 308 GTB, Adartico Vudafieri, Italian Rally Champion in 1984 and Michele Rayneri, winner of Gr.B class in 1987 with the same car, the Lancia 037. Many other drivers run with the Jolly Club Team. The Jolly Club one of the most important rally teams from Italy, because it lets a lot of young drivers run. After a bankruptcy in 1997 the Jolly Club closed. In 2007, the Jolly Club was reborn in Florence, Italy with new ideas by an Italian gentleman and driver, Andrea Guidi. The Mark is registered from 2007 in the European Economic Community and now the Jolly Club is an organization in TV, Media and Team for Motorsport passionates worldwide. Lancia Rally, Ritmo, Fiat Uno Turbo, Delta S4 and Delta 4WD. Apart from the rally also developed Formula 1 cars, F2, F3 and Formula Junior, where the team won several times. The team also collaborated with other brands like Ferrari and Porsche developing prototypes. The Jolly Club team was active in other areas of the world of motor racing developed and planned and financed the young hopefuls, led to the sponsors on their investments, built race cars, engines, parts, etc. 1 The results of the 1986 Rallye Sanremo were annulled by the FIA. ^ "Jolly Club: that cold and misty winter evening". lanciarally037. Retrieved 2011-12-01. ^ a b "1993 season data". Juwra.com. Retrieved 2012-01-26.